Different jaws can be installed into one universal body. It is possible to change the jaws in as little as one hour right on the construction site. Our demolition shears in action at the construction site of the London underground – one of the biggest projects in Europe. The modern generation of fixed and rotating pulverizers has been developed for primary and secondary demolition. 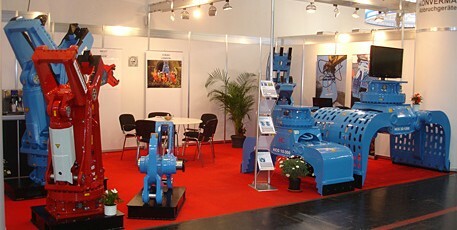 The modern generation of static and rotating pulverizers has been developed for primary and secondary demolition. The new generation of demolition and sorting grabs is perfectly suited for demolition, recycling and further work on construction sites. As a young and innovative company we develop attachments for excavators. These attachments are mainly demolition attachments. They are applied in the recycling and demolition industry. Our main goal is to offer our customers products with high end quality, excellent price-performance ratio and low maintenance costs. We see our main task in the attainment of competitive advantage for our customers. This is achieved by technical innovation and fast manufacturing with consistency in quality and low costs. © KONVERMA Abbruchgeräte. All rights reserved.